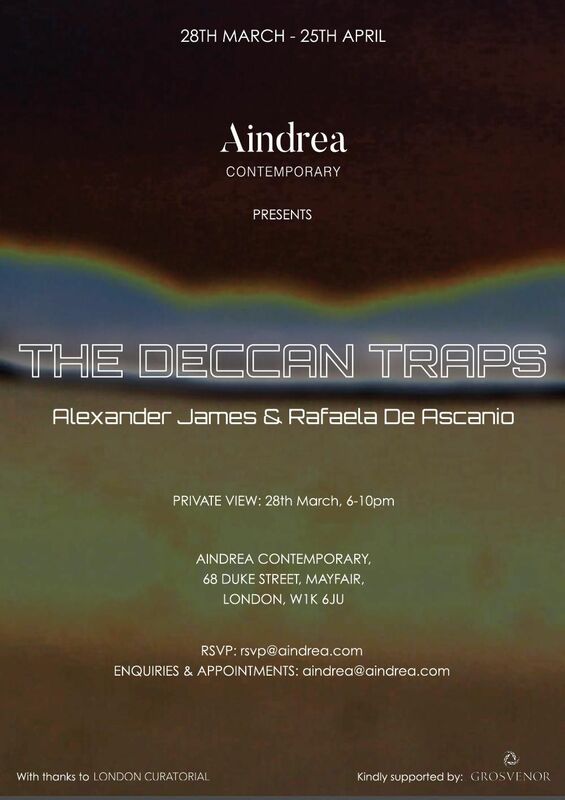 Aindrea Contemporary presents 'The Deccan Traps', featuring works by Alexander James & Rafaela de Ascanio in the mediums of painting, ceramics, installation, film and literature. 66 million years ago the volcano, Deccan Traps, erupted. The event catalyzed the extinction of dinosaurs, marking an end to a version of our world that we can only imagine in our dreams and in stories. 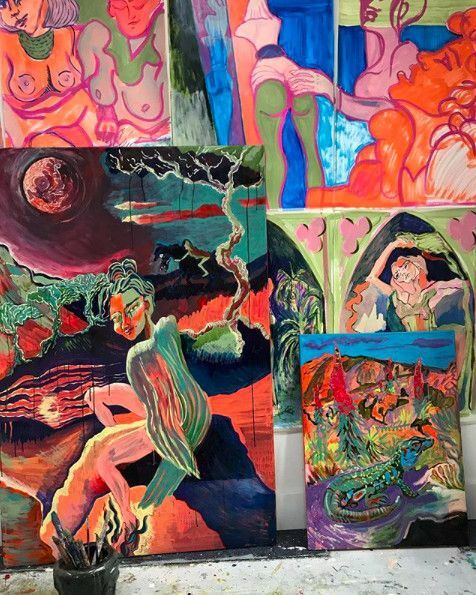 Together with artists Alexander James and Rafaela di Asanio, Aindrea Contemporary has re-imagined this catastrophic event in a fantastical manner. 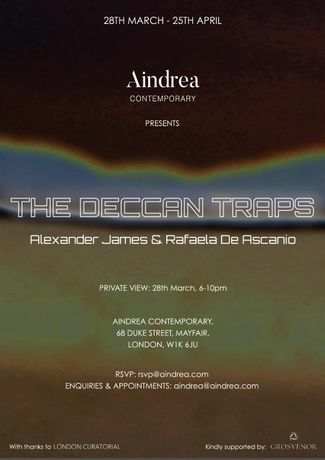 Aindrea Contemporary presents 'The Deccan Traps', featuring works by Alexander James & Rafaela de Ascanio. The collaborative project draws inspiration from storytelling, imagined histories, dreams, nightmares, secret organisations & the make believe. The two immersive spaces - united in the inaugural exhibition in the Mayfair space - will transcend viewers to part childhood bedroom, part fantasy land – through painting, ceramics, installation, film & literature that the artists have created. 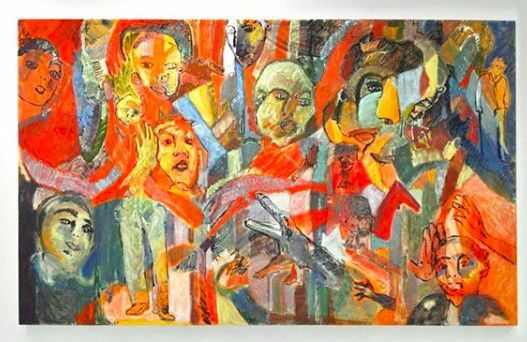 Alexander James will be presenting a new body of work featuring 8 medium and large paintings and an installation examining the themes in his work. James has always been drawn to the idea of recreating what he has already experienced, be that past footage, memories or stories. Deccan Traps will continue to bring these themes to surface. 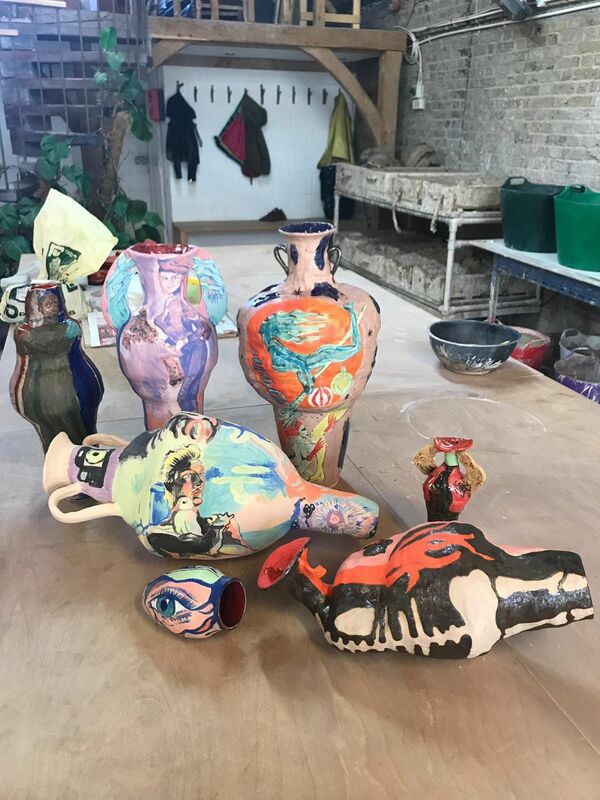 Rafaela di Ascanio will be presenting a new body of work consisting of 10 ceramic pots and paintings featuring worldly narrative scenes. This work is representative of her signature style, which reimagines art historical tropes; symbolism from Renaissance tarot cards, landscapes from mythological painting and compositions from Egyptian friezes. An Installation directed by the two artists will take you through the exhibition, nestling in corners and confronting you at times. This piece is inspired by post-apocalyptic scenes, ships wrecks, and Robinson Crusoe-style debris. It will be a living installation featuring real plants and other sources materials. A selection of books curated by the two artists will encourage the public to read, write their own stories, listen to audio of the artists retelling their own tales and watch clips from films created by artists, as well as the films that influenced them. Prepare yourself for a continuous eruption of creativity at Aindrea Contemporary’s Deccan Traps exhibition. This time, however, instead of lava, anticipate a multilayered flow of artistic narratives.